This summer, I had the opportunity to be a teaching assistant for a nine-student delegation from Hohai University in Nanjing, China for a two week Clean Energy and Environmental Ethics program. 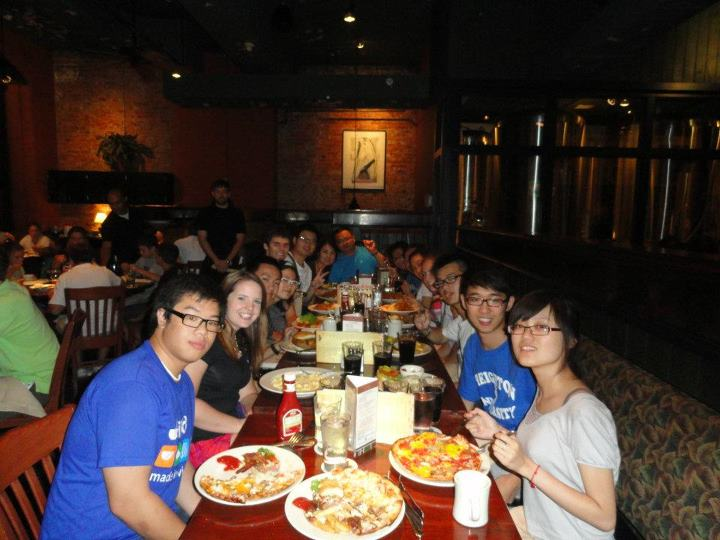 Under the leadership of Dr. Jinmei Yuan and Dr. Jiang Maorong, and with the help of Peter Khong, Amanda Heuszel, Jacqueline Horani, and myself, the group of international students spent their first fortnight in the United States exploring Creighton and Omaha. We visited the Old Market, Jocelyn Castle, Professor Ed Morse’s farm, and the students were even able to take a short road trip to Gavin’s Point Dam in Yankton, SD. They were an intelligent bunch, and in discussing the vast differences between Chinese and American culture I learned just as much—or more—than I taught! The picture above is from one of our first shared dinners; the waiter was taken aback by my request for eleven hot waters—not tea, the Chinese drink hot water like we drink iced water. The program culminated with a visit from Dr. Wang Cheng, the president of Hohai’s 34,000 students. I treasure the experience I had teaching and learning with my international peers, and I encourage everyone to step out of their comfort zone and discover cultures other than their own.